The Law Enforcement Torch Run will take protect and serve to a whole new level at this Tip-A-Cop fundraiser. 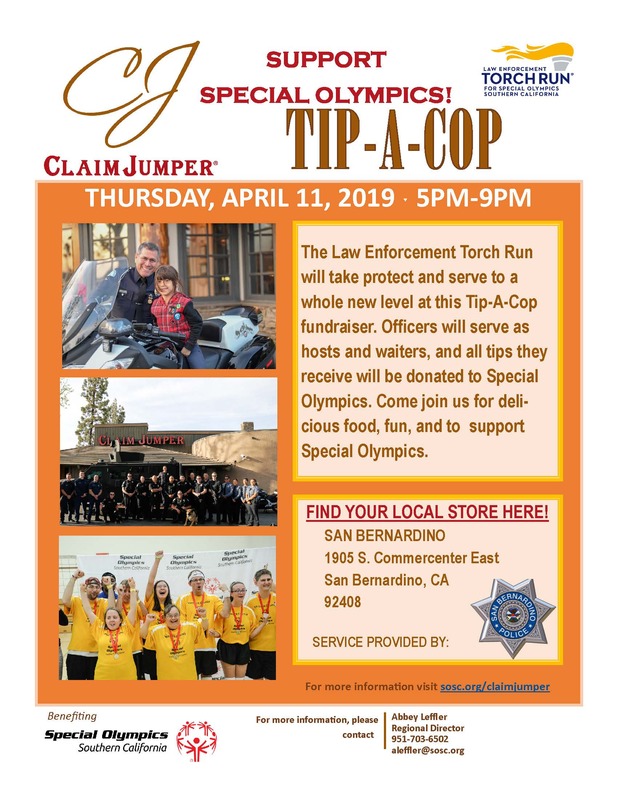 The San Bernardino Police Department and Rancho Cucamonga Police Department officers will serve as hosts and waiters, and all tips they receive will be donated to Special Olympics, Inland Empire Region. Invite your friends and join us for deli-cious food, fun, and to support Special Olympics. TWO LOCATIONS, Download the flyer above and share with your family and friends. 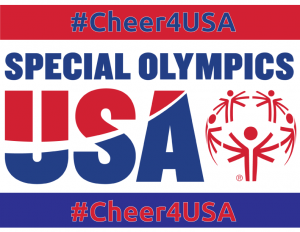 Shop at Albertsons, Vons and Pavilions from March 27 to April 23, 2019, and donate at checkout to support Special Olympics Southern California athletes. During the 2018 campaign, with the help of local shoppers, we raised over $1.24M! Thank you for supporting acceptance and inclusion! 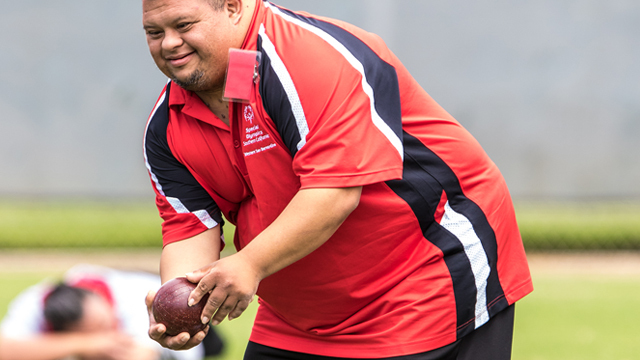 Your donation helps Special Olympics Southern California enrich the lives of even more athletes with intellectual disabilities through sports, health, and leadership programs. Please visit your local store and when you are checking out let the cashier know your connection with Special Olympics and that you appreciate their support. For example, "Hi my name is (your name) and I am a (volunteer, coach, athlete, fan, parent) of Special Olympics. 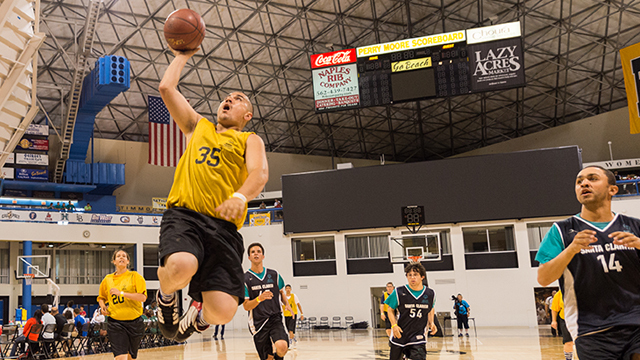 Your support is helping Special Olympic athletes win on and off the field. Thank you so much!" 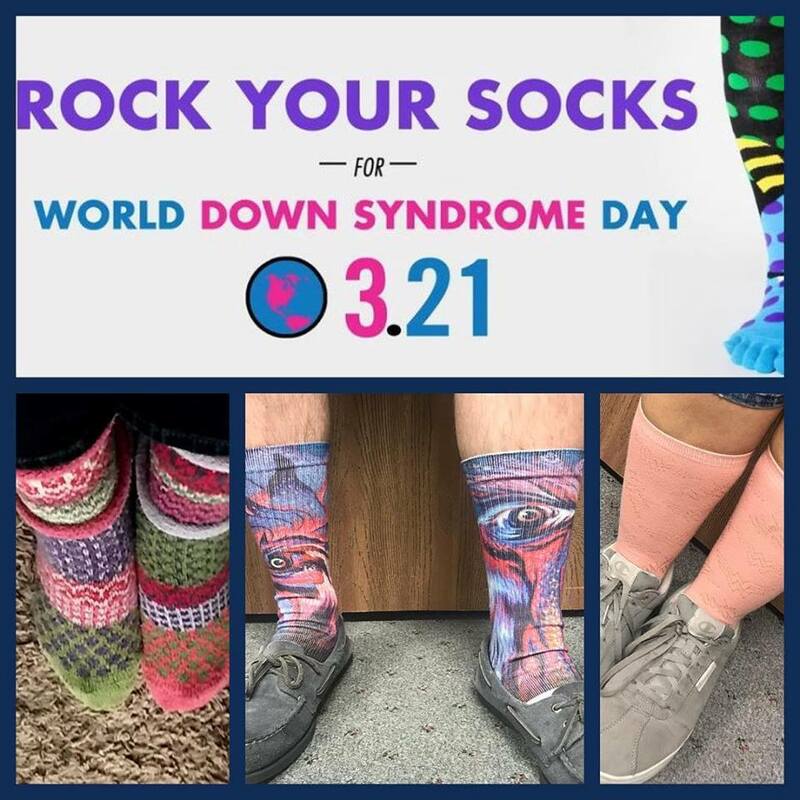 Your Inland Empire Staff is Rockin' Crazy Socks for World Down Syndrome Day! Fun fact: The reason World Down Syndrome Day falls on the 21st of the 3rd month, is to signify the uniqueness of the triplication of the 21st chromosome which causes Down’s. Bet you didn’t know that, did you? If that ever comes up in your pub quiz, you are welcome. Join us to acknowledge the day by wearing some crazy socks! Take photos and post them on your socials with the hashtag #WDSD19 and #wearesosc. 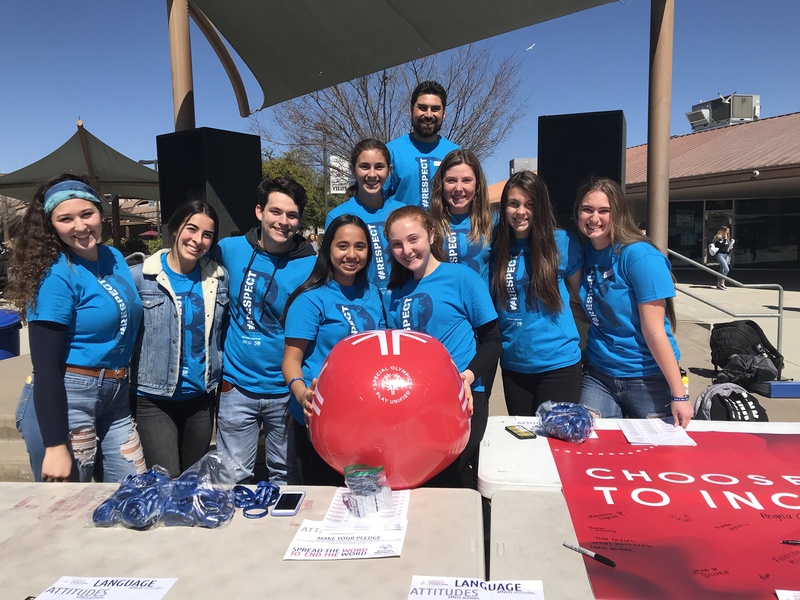 We'd like to congratulate Murrieta Valley High School on the success of their recent Respect Rally which was organized by their School Spirit Class and NEST (Nighthawks Engaging Students Together) Club. A Unified Champion School since 2017, the rally was structured as a 2 part event. For the first part of the event, athletes, students, partners, and teachers participated in Parachute Games, Corn Hole and Giant Jenga. The second portion focused on Unified Sports and making sure their athletes are an active part of the campus culture. 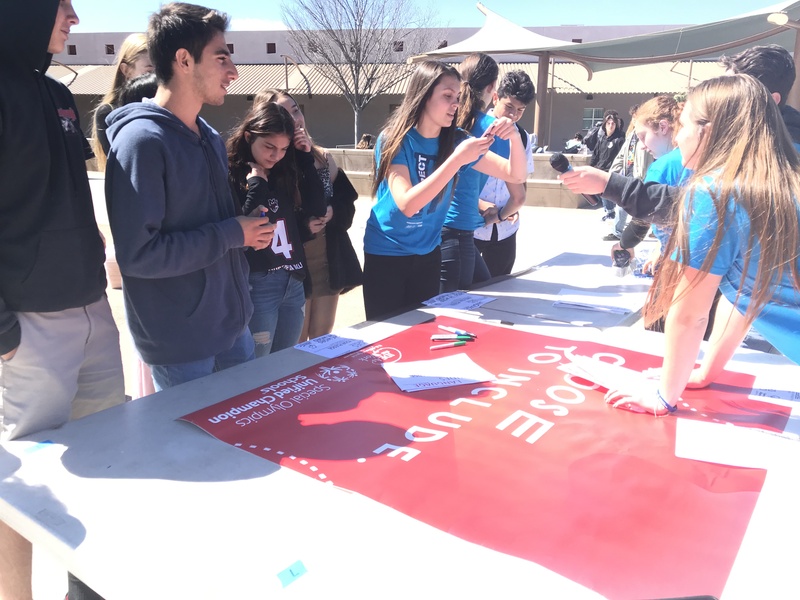 The pledge event took place during lunch where students and teachers had the opportunities to take the “R-Word” pledge. Upon taking the pledge, they each signed a banner that will be displayed in the school. About Unified Champion Schools: Special Olympics Southern California's Schools Program encourages inclusion, participation, and leadership in students through the power of sport. This partnership between schools and Special Olympics Southern California includes sports training and competition, inclusive youth leadership and whole school engagement for students of all ages. 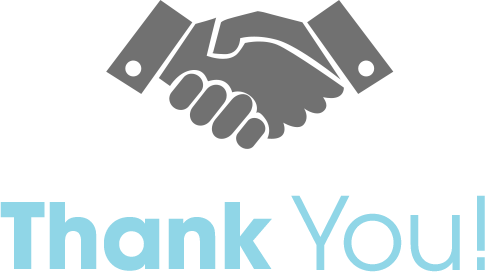 About Spread the Word: Spread the Word is a global engagement campaign to increase inclusion amongst people with and without and developmental disabilities through grassroots action. In schools, workplaces, and communities around the world, local leaders are taking a pledge to create socially inclusive places to learn, work, and live. Registration for the 18th Annual Temecula Torch Run is LIVE! Be a champion of acceptance and inclusion by joining us for our 18th Annual Temecula Valley Law Enforcement Torch Run benefiting Special Olympics Southern California Inland Empire Region. 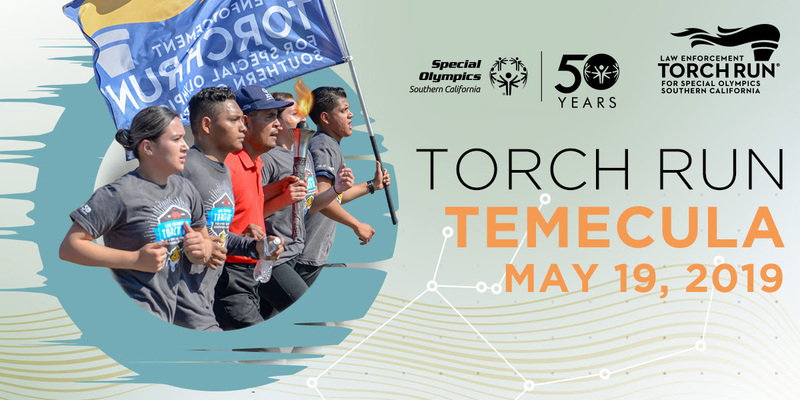 Join us on Sunday, May 19, as Special Olympics athletes and law enforcement officers carry the Flame of Hope through the streets of Temecula to raise awareness and funds for individuals with intellectual disabilities. This is a FUN community event! You, your family and friends can participate in this FUN RUN for a minimum of $30! Click HERE for all the details including information on attending the BBQ Celebration and sponsorship opportunities! The Opening Ceremony will be live on ESPNEWS, from Zayed Sports City Stadium, beginning at 11 a.m. ET on March 14. Kicking off World Games, the Opening Ceremony promises to be a must-see mix of hope, happiness, unity and inclusion, starring 7,500 Special Olympics athletes from more than 190 nations in front of 40,000 spectators — and expect performances from a stellar line-up of artists. The ceremony will culminate with Special Olympics athletes completing the Law Enforcement Torch Run®, carrying the Flame of Hope into Zayed Sports City and lighting a cauldron to mark the beginning of the Games. Joining 300+ members of the US delegation, our very own Krystal Johnson is will be competing in the tennis competition. 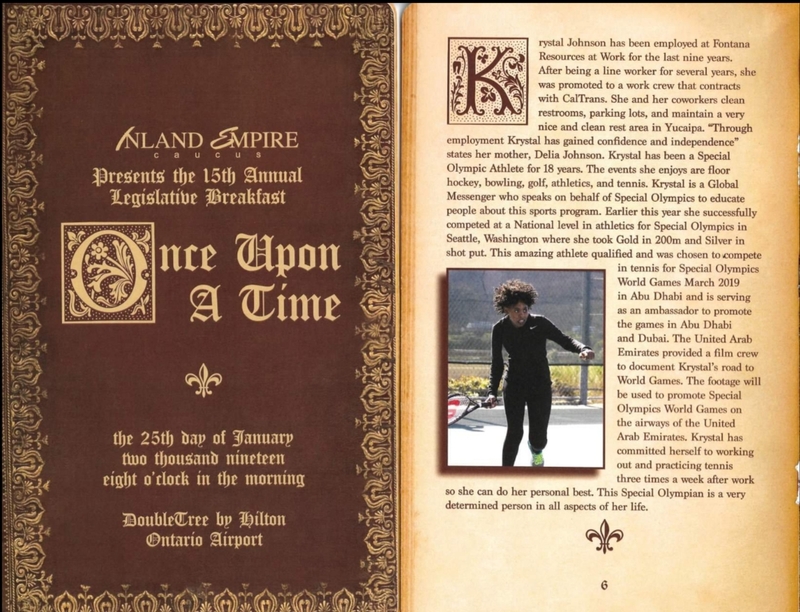 Click HERE to see Krystal's World Games Spotlight article. Congratulations Athlete/Global Messenger Krystal Johnson! On January 25th, our very own Krystal Johnson was recognized by the Inland Empire Caucus at their 15th Annual Legislative Breakfast. Krystal has been employed at Fontana Resources at Work for 9 years. After being a line worker for several years, she was promoted to a work crew that contracts with CalTrans. "Through employment, Krystal has gained confidence and independence." states her mother, Delia Johnson. Krystal has been a Special Olympic Athlete for 18 Years. The events she enjoys are floor hockey, bowling, golf, athletics, and tennis. Krystal is also a Global Messenger who speaks on behalf of Special Olympics to educate people about our sports program. 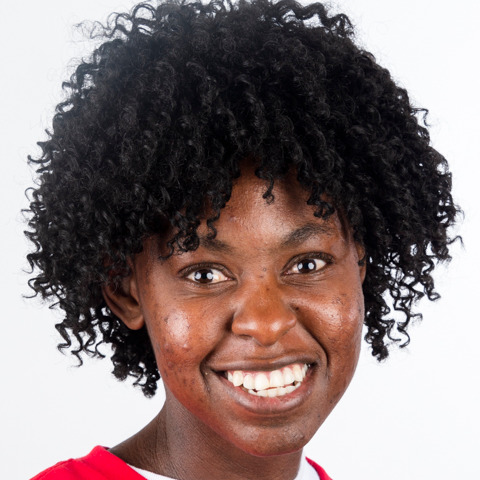 Earlier this year she successfully competed at a National level in athletics in Seattle, Washington where she took Gold in 200m and Silver in shot put. This amazing athlete qualified and was chosen to compete in tennis for Special Olympics World Games, March 2019 in Abu Dhabi and is serving as an ambassador to promote the games. The United Arab Emirates will provide a film crew to document Krystal's road to World Games. The footage will be used to promote Special Olympics World Games on the airways of the United Arab Emirates. Krystal has committed herself to working out and practicing tennis three times a week after work so she can do her personal best. Please join us in congratulating Krystal for this recognition and for all her hard work to be the amazing person she is! 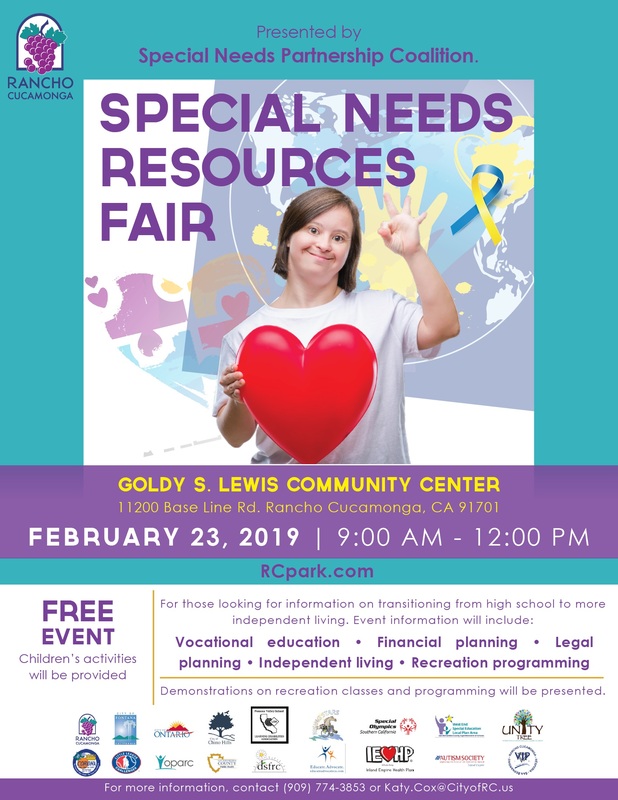 The Special Needs Partnership Coalition will be hosting a Special Needs Resource Fair at the Goldy S. Lewis Community Center in Rancho Cucamonga. This is a FREE event for the community and for those looking for information on transitioning from high school to more independent living. The event will include information on Vocational Education, Financial Planning, Legal Planning, Independent Living and Recreation Programming. A quick shout out to all the volunteers who helped make this weekend's Inaugural Orange County Festival of Speed an amazing success! Through the pouring rain on Saturday and the frigid wind on Sunday, more than 60 volunteers were outside the venue keeping smiles on their faces and making the event registration process run smoothly. Another 25 volunteers were inside making sure the SOSC and LETR information and merchandise booths were staffed. A few others spent the day taking care of the event VIP's. 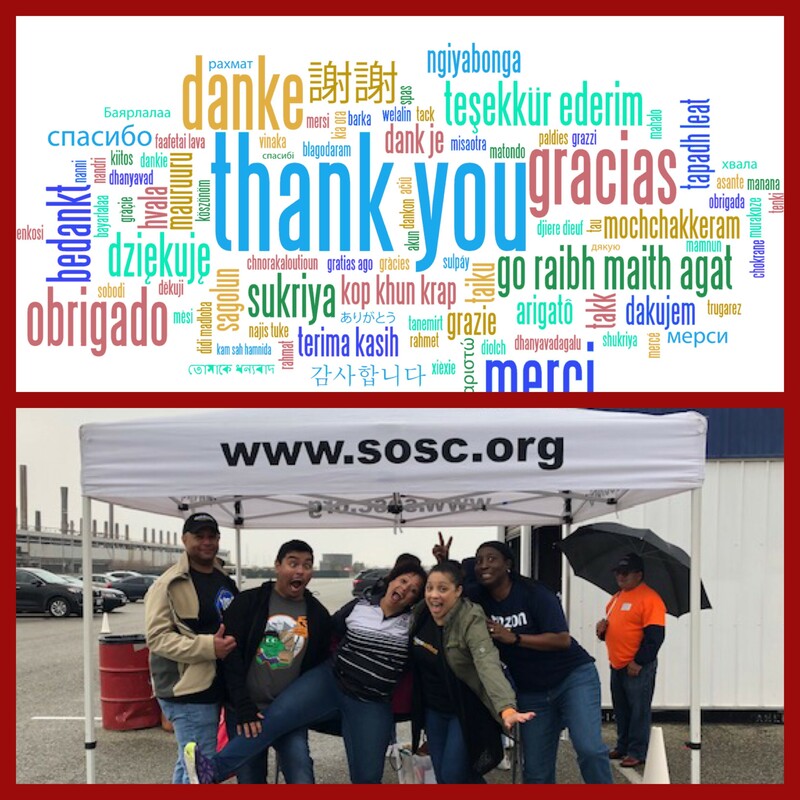 Special recognition to the folks at Amazon, Bosco Legal Services and Alpha Phi Omega, UC Riverside who sent multiple members to volunteer with us for the weekend. In its inaugural year, we hope to elevate the car show from its roots to a new level rivaled only by England’s Goodwood Festival of Speed. Instead of a hill climb to showcase the greatest automobiles in the world, we hope to highlight them in a more relatable and appropriate element – a superspeedway with a road course! And what better course than the AutoClub Speedway located in Fontana, California. We will have the opportunity to watch some of the world’s most extreme hypercars and exotics do what they do best – showcase their performance abilities on a track with side-by-side racing, high speed passes, extreme acceleration, and maybe even the occasional burnout! 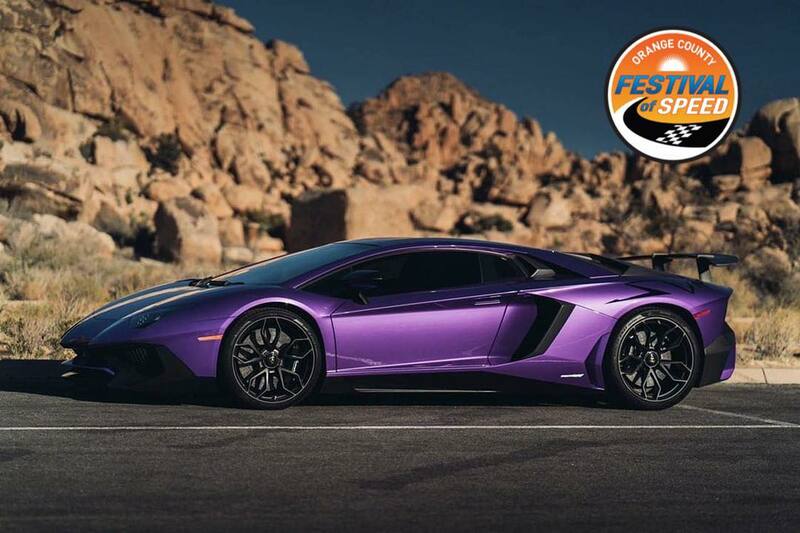 The OC Festival of Speed will surely offer attendees something unique, exciting and exhilarating to witness for the first time in the U.S.
Don’t miss this unique opportunity to see the world’s greatest cars do what they were intended to do! Click HERE to register to attend the event! 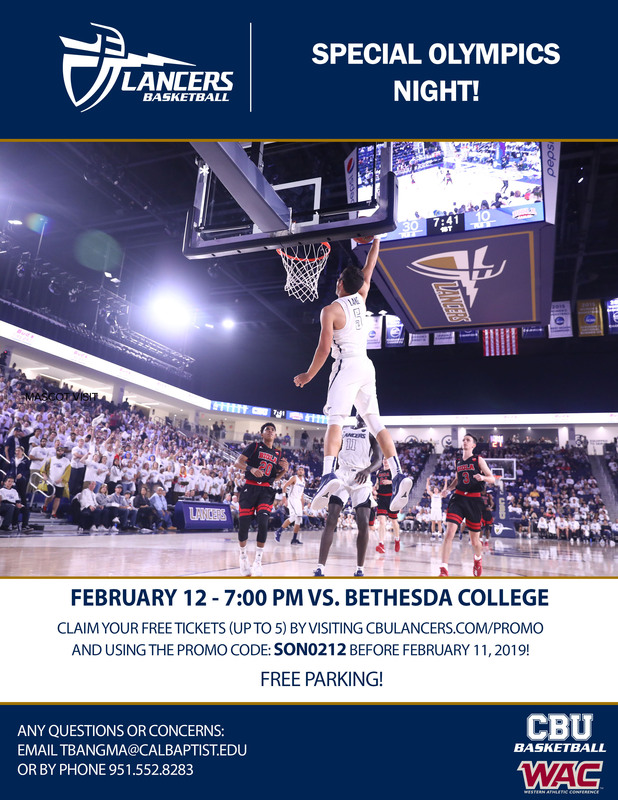 Using the promo code: SON0212 before February 11th, you can claim up to 5 free tickets to the Lancers vs. Bethesda college game! Volunteer registration for the 2019 Inland Empire Regional Spring Games in Fontana is now open online. Do you enjoy the sports of Aquatics, Basketball or Bocce? Then don't miss your chance to become one of our volunteers needed to create a transformative experience for the athletes with intellectual disabilities who will compete. January 9th is National Law Enforcement Day! Happy Holidays & Office Closure Reminder! 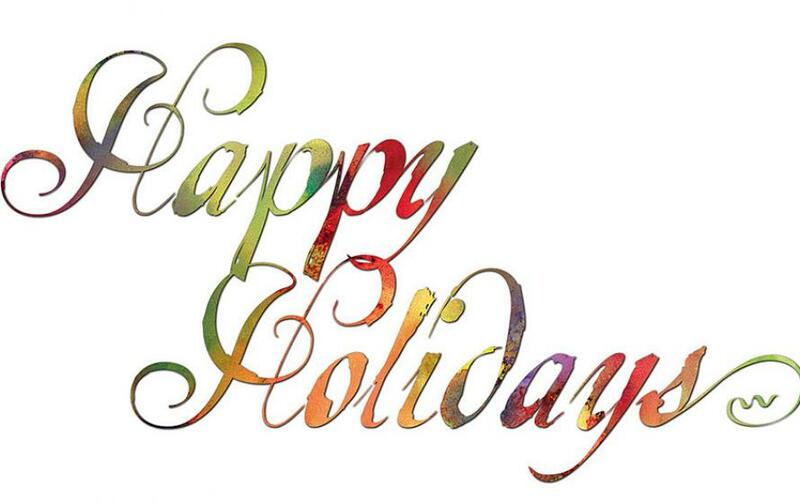 Reminder: The office will be closed from 12 PM on Friday, December 21 - Tuesday, January 1st. We will be back in the office on Wednesday, January 2nd, ready to kick off the new year! 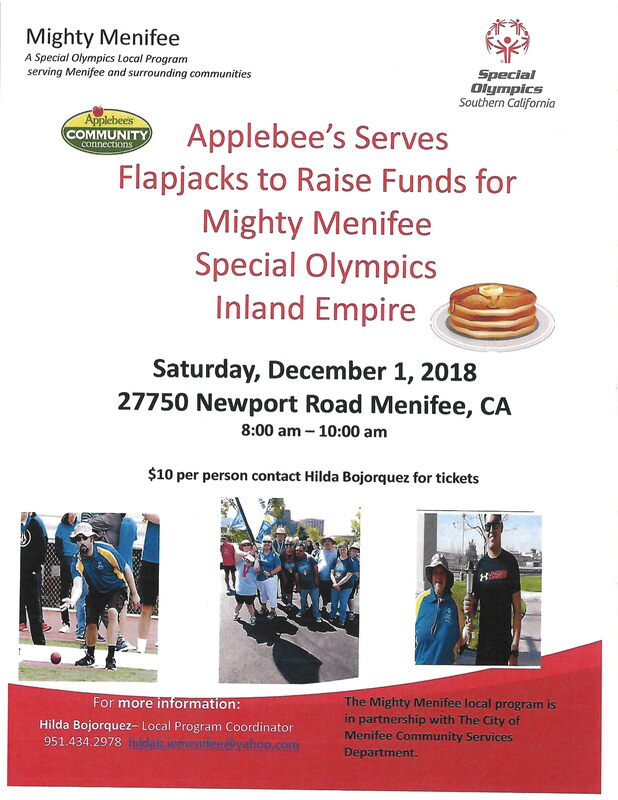 On Saturday, December 1st, through the "Applebee's Community Connections" program, Applebee's Menifee hosted a "Flapjacks" fundraiser to benefit Special Olympic Southern California Mighty Menifee Local Program. Through the support of the local community, the event raised $1,230 that will go directly towards the Mighty Menifee program. Thank you to all who attended and supported. On Friday, October 19th, The Murrieta Knights of Columbus sponsored their "Harris Gehl Memorial Annual Golf Tournament". This year, Special Olympics Southern California, Inland Empire Region was proud to be named as the beneficiary. 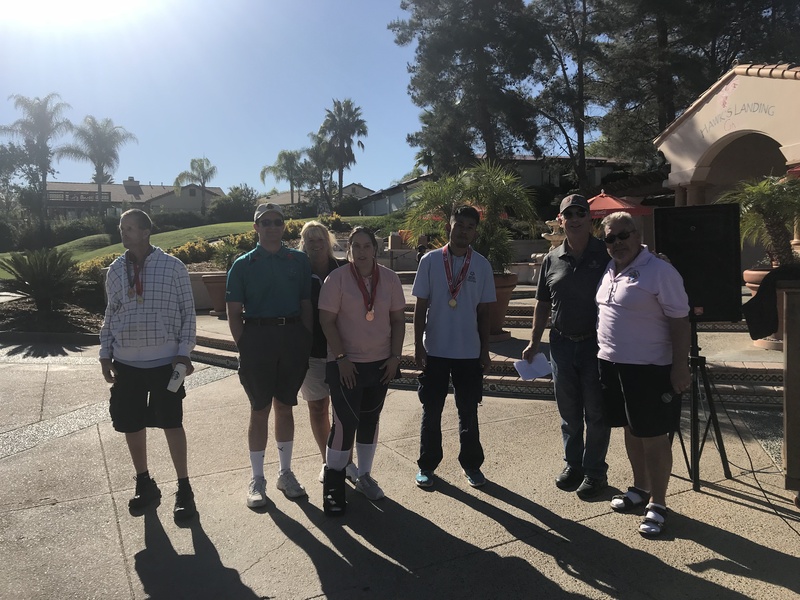 Taking place at the Redhawk Golf Course in Temecula, the tournament had an amazing turnout of participants and the weather was perfect!! The event kick-off included Athlete presentations and upon completion, an amazing $8,793 was raised. 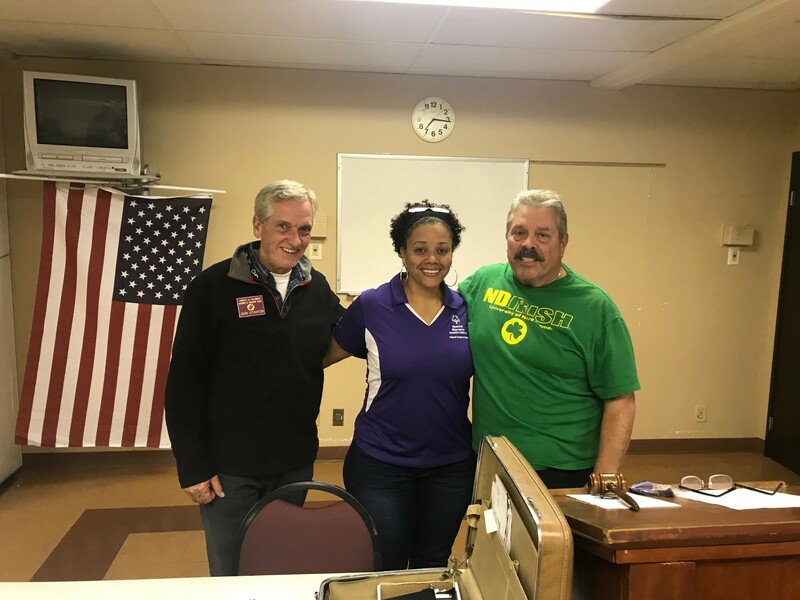 Participation in Special Olympics is FREE to all athletes and their family members, and we rely on the generosity of individuals and community members like the Knights of Columbus to help us make a difference. 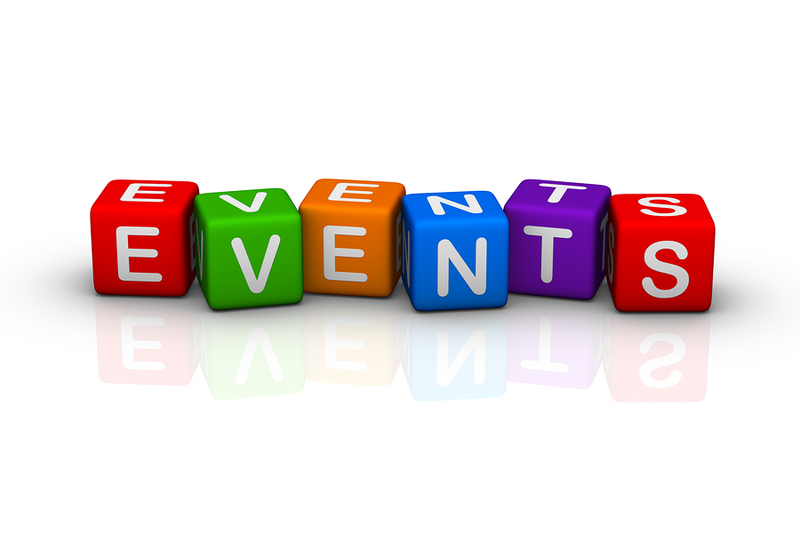 If you enjoy event planning and have been wondering how you could get involved with Special Olympics, please consider joining one of our fundraising committees. We are looking for volunteers to help us increase awareness of and raise funds for Special Olympics Southern California, Inland Empire Region. 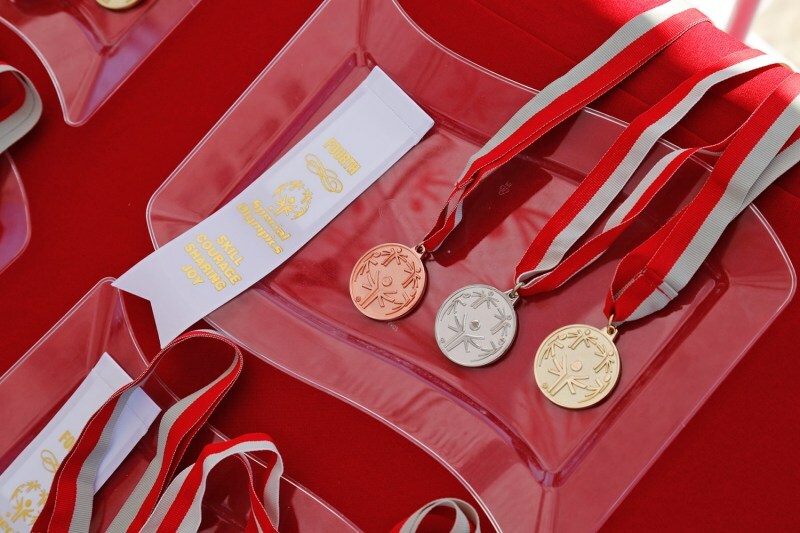 As you may or may not know, participation in Special Olympics is FREE to all athletes and their family members, so we rely on donations and fundraising events to help us make a difference. If you would like to receive more information about any of these events, please contact Mimi Wright, Administrator of Volunteer Engagement at mwright@sosc.org. 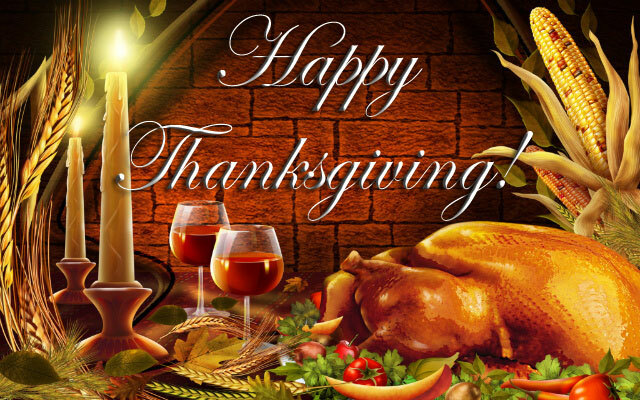 From your staff at the Inland Empire! With 2 solid hours of dancing sweating and having a great time, we raised $1,000 that will go directly towards supporting Special Olympic Athletes in the Inland Empire Region. We want to thank Zumba Instructors Zuzu Zumba, Krissy Vandy, Marie Ynami, Jeri Lee and IE staff member Mimi Wright for bringing their amazing energy to the party. Venue Host, The Active Church in Yucaipa and vendors, Domillisa, Partylite by Brittany, and Laura's LulaRoe Box for your support and donations to the raffle drawing. All of the students, families, and friends who joined us on the dance floor were amazing and you can see pictures and videos of all the fun on the Facebook Event Page. Temecula Valley Area Director Sue Reed Recognized! 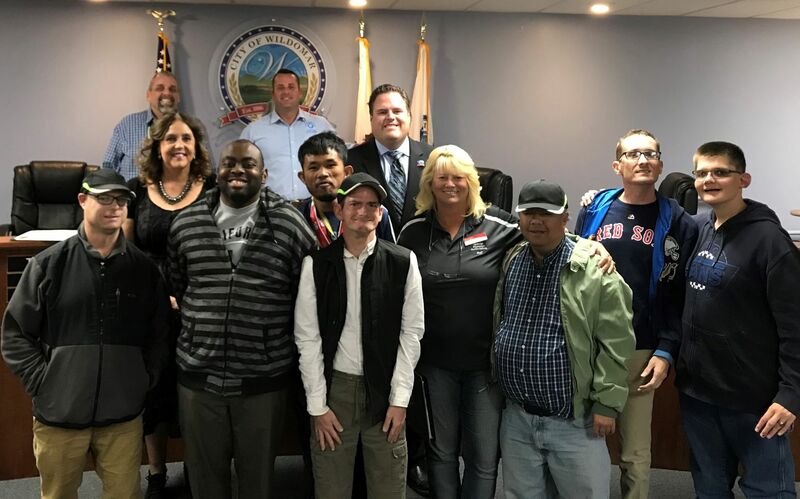 The City of Wildomar recently recognized our very own Sue Reed in appreciation of her hard work, dedication and compassion in assisting and participating in the Cop-On-A-Rooftop event held at their local Dunkin' Donuts on Friday, November 2nd to benefit Special Olympics Southern California, Inland Empire Region. Congratulations Sue! A recognition well deserved! Congratulations to Local Program Coordinator Hilda Bojorquez! 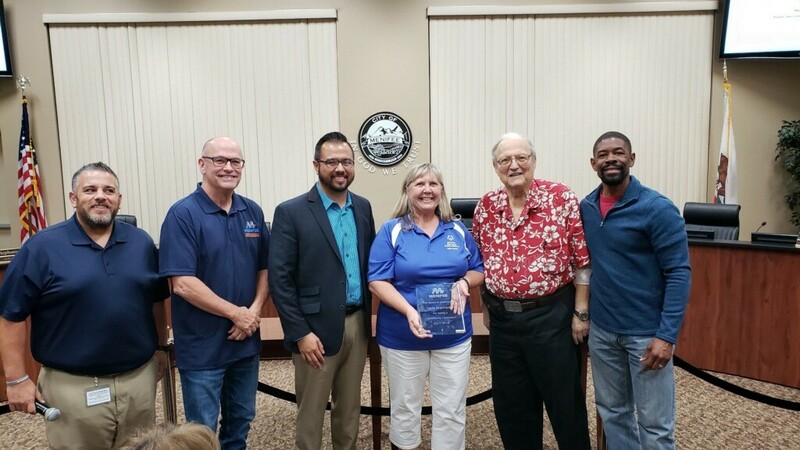 The City of Menifee recognized our very own Hilda Bojorquez as a “Community Champion” by the California Parks & Recreation Society (CPRS) for her tireless efforts improving the quality of life for Menifee residents through her commitment to Special Olympics - Inland Empire Region. The Community Champion Award honors and recognizes individuals and organizations who have contributed significant effort to influence and improve the quality of their community through parks and recreation. Please join us in congratulating Hilda. We know is that she very deserving of this recognition! A Successful Red Robin Tip-A-Cop! 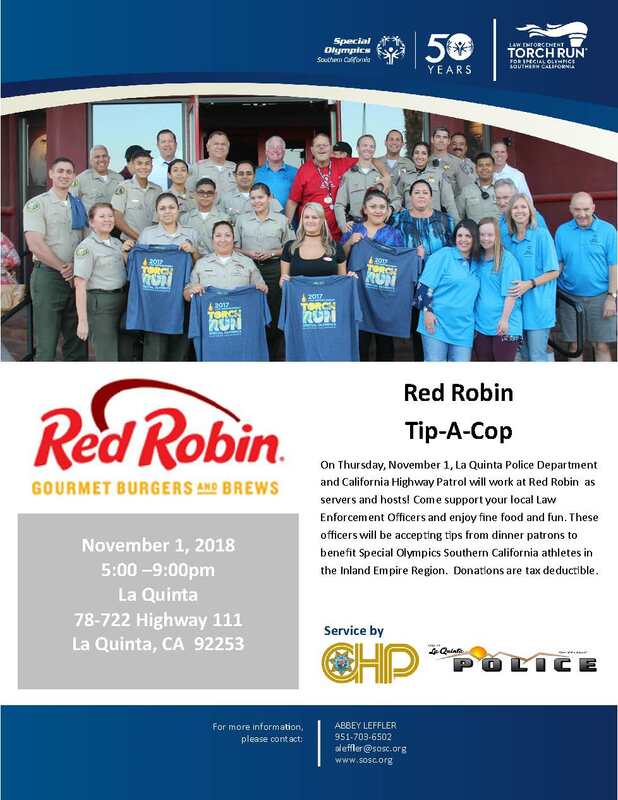 We'd like to send a big shout out to the La Quinta Police Department and California Highway Patrol, Red Robin staff, SOSC Athletes and family members along with the local community who came out to support the Red Robin Tip-A-Cop on November 1st. The event was a success and together we raised $1,184! All funds raised to benefit Special Olympics Southern California athletes in the Inland Empire Region! Thank you Barstow Sheriff's Station and Barstow CHP for all your support! 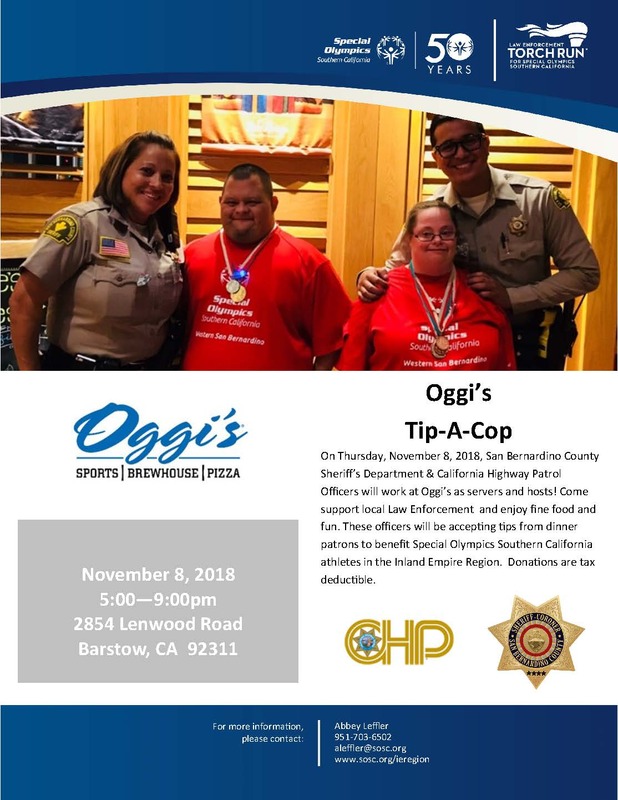 On Thursday, November 8, 2018, Barstow County Sheriff's Station & California Highway Patrol Officers worked alongside the Oggi's staff to raise an amazing $2,563 to support the Special Olympics athletes in the Inland Empire Region! Cop-On-A-Rooftop is Happening All Throughout Southern California THIS FRIDAY! 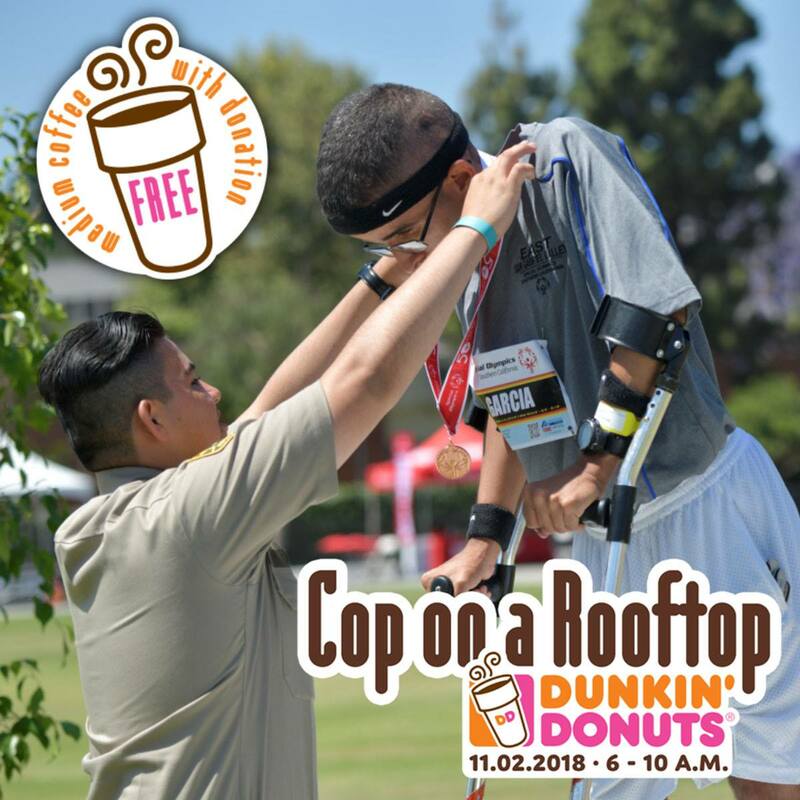 Join us on Friday, November 2nd from 6-10 am for our second annualDunkin' Donuts Cop On A Rooftop event taking place at 68 locations across Southern California. 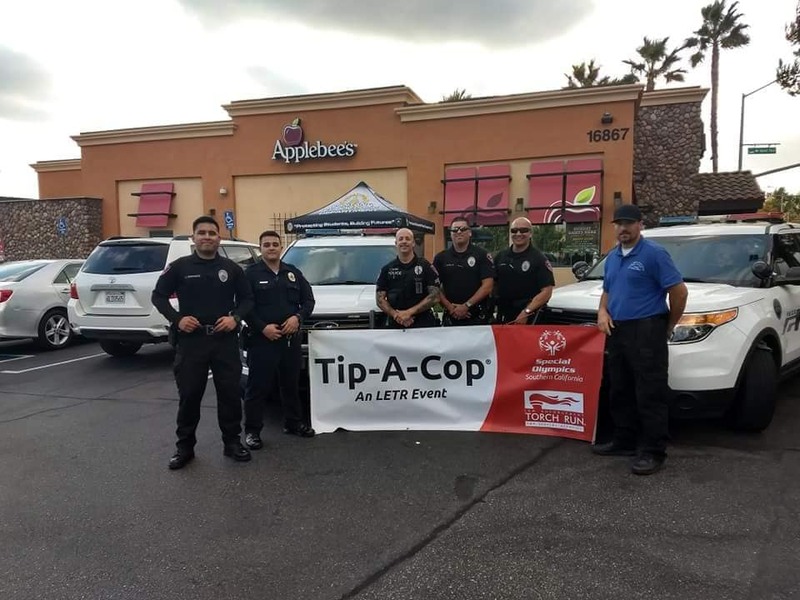 During the fundraiser, local law enforcement officers will stake out Dunkin' Donuts rooftops to heighten awareness and raise money for Special Olympics Southern California. Everyone who makes a donation at this event will receive a coupon for one FREE medium coffee! For a sixth year, Big League Dreams’ facility played host to the Inland Empire Regional Fall Games this past weekend in Perris. For more on this story, click HERE. Red Robin Tip A Cop Success! THANK YOU to all the supporters of the November 1st Red Robin Tip-A-Cop! 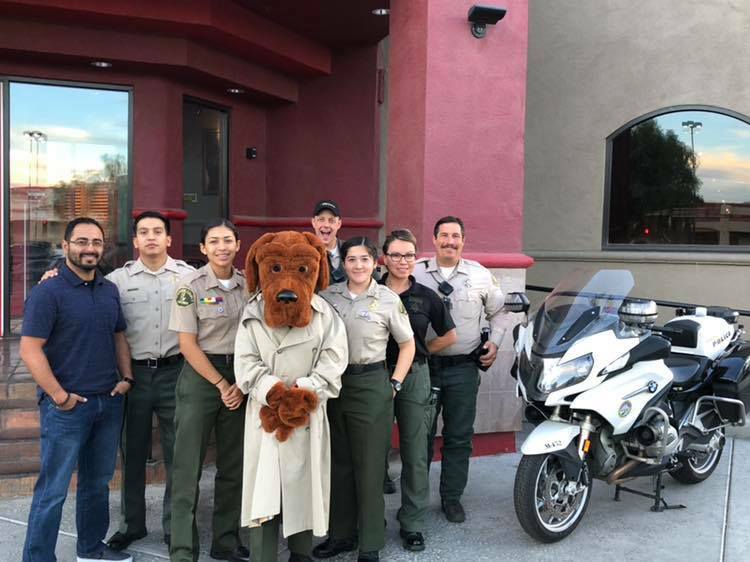 The La Quinta Police Department, California Highway Patrol Officers and The Thermal Sheriff Explorers worked alongside the Red Robin staff to raise an amazing $1,184 to support the Special Olympics athletes in the Inland Empire Region! THANK YOU to everyone who helped make the October 18th Applebee’s Tip-A-Cop a success! The San Bernardino County Sheriff's Department and California Highway Patrol Officers worked alongside the Applebees staff to raise an amazing $2,180.00 to support the Special Olympics athletes in the Inland Empire Region! Thank you to everyone for your support of Special Olympics and all of our athletes, coaches and volunteers. California Pizza Kitchen Tip-A-Cop was a Huge Success! A huge SHOUT OUT to all who helped make the October 11th California Pizza Kitchen's Tip-A-Cop a success! 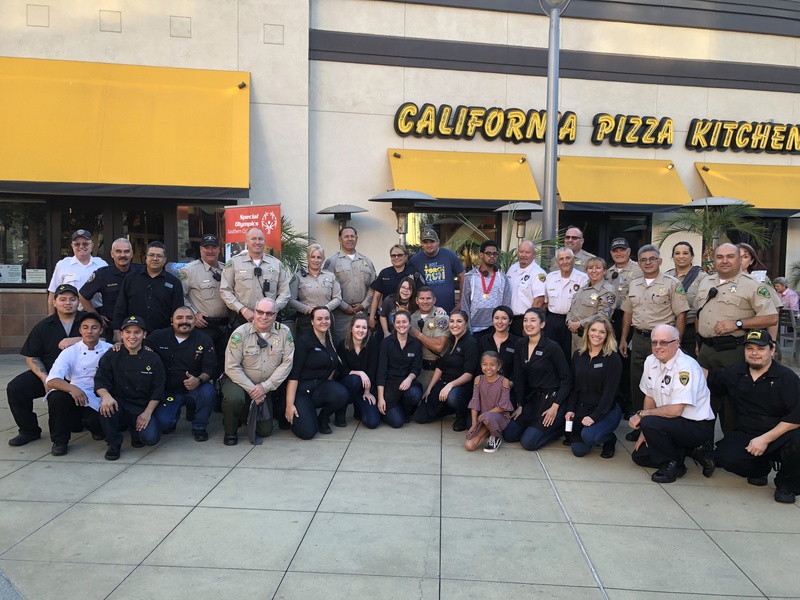 Law Enforcement Officers in Chino Hills, Palm Desert, Rancho Cucamonga and Temecula worked along CPK's awesome servers and hosts and raised more than $7,815 in tips and other donations to support our Special Olympics Athletes! Show your support for local athletes with Down Syndrome and other intellectual disabilities, by attending a Special Olympics event. Whether you attend a competition or fundraisers, our athletes will be excited by the encouragement they receive from the community. A huge THANK YOU to everyone for making the October 4th Applebee’s Tip-A-Cop a success! We're excited to announce that a total of $4311.00 was raised to support our Special Olympics athletes! 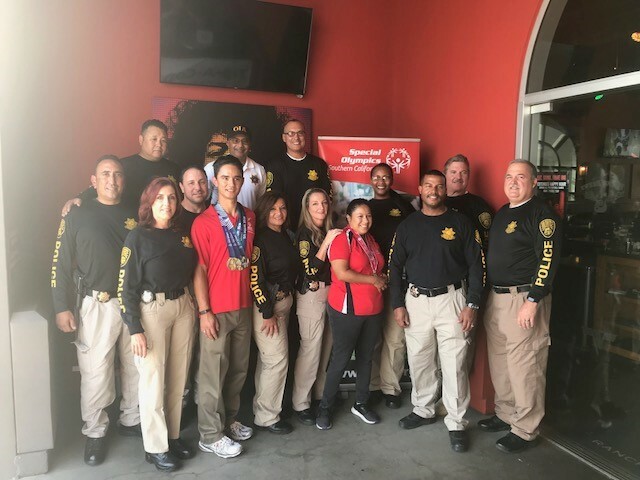 We'd like to send a big shout out to the California Department of Corrections and Rehabilitation Special Agents, Rock & Brews staff, SOSC Athletes and family members along with the local community who came out to support the Rock & Brews Tip-A-Cop on September 20th. The event was a success and together we raised more than $2,200!